Former Israeli Prime Minister Ehud Barak Welcomed to Speak on "Identity"
Farquhar College of Arts and Sciences Division of Humanities at Nova Southeastern University shared a powerful evening with former Israeli Prime Minister Ehud Barak, as part of the college's Distinguished Speakers Series. This event took place from 7:00-8:30 p.m. on Wednesday, February 14, at the Rose and Alfred Miniaci Performing Arts Center. 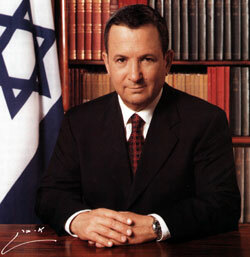 Barak served as the tenth Prime Minister of Israel from 1999 to 2001. During his tenure, Israel withdrew its forces from South Lebanon and the Al-Aqsa Intifada erupted. Barak also took part in peace negotiations with Syria and the Palestinian Authority while in office, with the active participation of Bill Clinton and his administration. In 2001, Barak's broad coalition of secular left-wing, moderate centrist and religious right-wing parties dissolved, leading the way to Barak's defeat by Ariel Sharon in the 2001 elections. On January 7, 2007, Barak launched a political comeback by announcing that he will seek the leadership of Israel's Labor Party in the May primary elections. As party chairman, Barak would be positioned to serve as Defense Minister and in good standing to possibly run for the country's highest office. Early polls show Barak in the lead over all opponents. Prior to becoming Prime Minister, Barak completed an illustrious 36-year career in the Israeli Defense Forces as the most decorated soldier in Israeli history. For many years, he led Israel's elite anti-terrorist unit and, on one occasion, successfully stormed a hijacked airliner in Tel Aviv. On another mission, Barak disguised himself as a woman and led a raid against the organization that murdered Israeli athletes at the 1972 Munich Olympics. This incident was portrayed in the 2005 Academy Award-nominated film, Munich, directed by Steven Spielberg. Barak additionally served his country as Minister of the Interior, Minister of Foreign Affairs, and Defense Minister. Barak earned his bachelor's degree in physics and mathematics from the Hebrew University in Jerusalem in 1976 and his master's degree in engineering-economic systems in 1978 from Stanford University. Prime Minister Barak's political, educational, and military backgrounds give him a unique perspective for assessing the key challenges of world terror, international diplomacy, globalization, and the free world in the 21st century. The topic of Prime Minister Barak's presentation touched on the Farquhar College of Arts and Sciences's 2006-2007 academic theme of "Identity." Throughout the year, the college explored the various meanings and implications of "Identity" through a range of interdisciplinary programs and activities that focused on insight from the humanities, social sciences, and physical sciences. In addition to campus visits by Barak and other distinguished speakers, the college designed special courses around the theme and incorporated it into the theatre program's season, student-faculty reading groups, and faculty lectures.